Easily grown in average, medium moisture, well-drained soils in full sun to part shade. Best in full sun. Good soil drainage is essential. Plants will perform poorly and may not survive winter in hard clay soils that retain moisture. Plants tolerate heat and some dry soils once established. Deadhead spent flowers to promote additional bloom. Plants may not be reliably winter hardy throughout the St. Louis area where they should be planted in protected locations (e.g., southern exposures). Leave flower and leaf stems up during the winter for additional protection, cutting back the dead stems in late winter to early spring. Sandy/gravelly mulches will protect plants and help to avoid onset of rot. Plants may also be grown in containers (pinch back foliage tips in spring to limit mature plant height). Take cuttings from containers in late summer for overwintering. Plants will spread in the garden by self-seeding. Agastache rugosa, commonly called purple giant hyssop, is an upright, clump-forming, herbaceous perennial that typically grows to 2-3' tall. Leaves and flowers are aromatic. It is native to moist grasslands, valleys and stream banks in China, Vietnam, Laos, Korea and Japan. Fragrant, tubular, 2-lipped, violet-pink flowers bloom summer-to-fall in whorls on erect, terminal, salvia-like spikes (each to 2-4” long) atop strong, rigid stems. Flowers are attractive to bees, hummingbirds and butterflies. Aromatic (anise scented), toothed, lance-shaped to ovate leaves (to 3" long) are blue green. Genus name comes from the Greek words agan meaning very much and stachys meaning an ear of wheat in reference to the flower spikes. 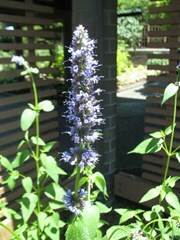 ‘Honey Bee Blue’ features intense blue flowers and aromatic gray-green foliage. Sweetly fragrant, tubular flowers in whorls bloom on erect, salvia-like spikes atop stems typically growing to 24-36” tall. Flowers appear over a long summer bloom period. Leaves may be used fresh or dry to flavor teas. No serious insect or disease problems. Crown/root rot may develop in poorly drained soils. Watch for rust, powdery mildew and leaf spots. Borders, herb gardens or butterfly gardens. Also a good container plant.